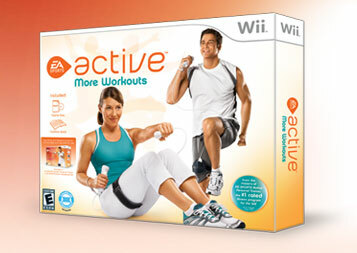 This morning I finished my "EA Sports Active More Workouts" Six Week Challenge on my Wii! I did it on the medium intensity and finished it in the six weeks. I still get irritated when my moves don't register properly - the Squash game, for example, involves lunging to the left and right, and sometimes it just doesn't register my lunge - even though I'm totally lunging! I wonder if EA has any "bigger" folks testing their games. Frankly, my thighs move and jiggle more than a skinny person's, and I think that throws things off for me with this game. The Squash game annoys me the most with this, because you have to start back at the slow speed when you miss a shot - and I'm doing the darn lunge, I didn't miss anything! - but it didn't register because my big ol' thigh is still moving. For those of you who are not familiar with this game, it uses a strap around your thigh where you insert the Wii's nunchuk controller. The strap is neoprene and adjustable, which is handy. But the nunchuk is not wireless, so I am CONSTANTLY smacking myself with the cord when I'm using the regular controller and the nunchuk in my hands. There's a squat-then-reach-above-your-head exercise which should be renamed "smack-yourself-in-the-face-repeatedly". There's a new version of this game coming out in the fall - "EA Sports Active 2" - which will be on the Wii and I think also the XBOX and PS3, but I'm a Wii girl all the way. This new game is going to be expensive - $100 - but will be wireless (yay!) and include a heart-rate monitor (which I'm pretty sure will only work in this game and not when doing other non-Wii things sadly). Should be interesting to see what the feedback is on this new one. I'm also very curious about the new "Gold’s Gym Dance Workout" game for the Wii - I do love to dance, but I hated the "Just Dance" game - it was such a letdown and I didn't feel like I was doing much that was fun. Feh. I am so apprehensive of buying exercise video games because I *hated* that stupid Jillian Michaels game (bought it the day it came out - big mistake there!) and also didn't care for Your Shape or that Just Dance either. Any video games getting you to move more these days? Hope the week is treating all of you well. I am totally addicted to frozen yogurt. I love this tart froyo trend, and the self-serve places are terribly addictive too. 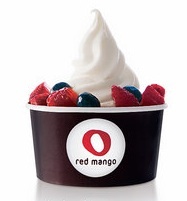 However, my favorite place for quality tart froyo is Red Mango. It's all-natural with probiotics and all kinds of other good things in it. They've got a number of flavors, but I always just stick with the original (tart) flavor. No artificial sweeteners in there, which I appreciate. You could be all healthy and get it with no toppings - or just fruit toppings like this photo. But I cannot resist two of their toppings. Mochi is a Japanese rice-based chewy candy of sorts, and it is tasty (and available at most froyo places). Red Mango's unique topping is their Ghiradelli dark chocolate mini chips. I LOVE these things. They are tiny - which is perfect for froyo so you're not getting a mouth full of chocolate with no room for the frozen treat. And they're dark, which is very tasty. Highly recommended. Just watch out for the portions - their nutritional info on their web site shows a serving size at 1/2 cup, but the small size is 1.4 servings, regular is 2.3 and large is 3.5. I finally met with a dietician today to discuss my weight and diet. She thinks I should be eating more, and also that I should go for a low-carb high-protein diet for awhile. I don't have the paperwork in front of me, but my BMR is 1750 or so, and she said I shouldn't be eating less than that - which surprises me. I thought I just was supposed to stay above 1200 calories, net after subtracting calories burned with exercise. She wants me to eat 200 grams of protein and 135 grams of carbs a day (and 1800-2000 calories total). Sparkpeople says 1,240 - 1,590 calories, including 60 - 130 grams of protein and 168 - 242 grams of carbs. So... that's a bit different. It's going to be challenge to get in that much protein, that's for sure. Lots of egg whites, chicken breasts, Greek yogurt and protein powder. She suggested 2 protein shakes to help max out my protein - the powder I bought is 25g each serving, so two of 'em hits 25% of my protein for the day. I figure I'll give it a try. I've read so much about the low-carb diets and how they're not sustainable, but they do help people drop some weight to start. I feel like my body needs a kick in the pants, so to speak, so maybe this will help. Or maybe I'll just gain all the weight back and be obese forever. Oy. Anyway, yes, this is a healthy living blog, so why am I talking about pizza? Well, this pizza claims it is two servings, and one serving is a mere 300 calories so it would work into a healthy-ish diet for a rare occasion. Side rant: this pizza's total weight is 7.5 ounces. I didn't measure the pizza before we ate it, but the box is only six inches along the side. This is not two servings. Additional rant: the nutrition facts don't add up. One serving - 1/2 the pizza - is 300 calories, but the whole pizza is 590 calories. C'mon. We're not stupid. OK, so - did it taste good? NO! I'm from Chicago, I know deep dish pizza. This never even met a deep dish pizza. It never saw a photo of a pizza. It was pathetic. I get more satisfaction from the pepperoni pizza Lean Pocket. What a ridiculous waste of money and fat. The crust was butterlicious, but I had to go find something else to eat and felt ripped off for those 300 calories. New! A new 100 calorie pack from Nabisco! Notice the fine print... there are only 5 packs in this box. The "regular" 100 calorie boxes come with 6 packs. This new product is the same price as the others. I am *not* pleased with the ol' grocery-shrink-ray action here. But I am a chocolate addict, and I love nothing more than chocolate and mint. So I had to buy a box to give it a try. And... I won't be buying another box. These are okay. They've got this white chocolatey coating on the bottom which is a little odd. The flavor is okay, but frankly, these are not as good as the Keebler 100 Calorie Grasshopper cookies. And the loss of one pack from the box is the nail in the coffin on this one. Lame move, Nabisco. Back to more tasty reviews! I like the 100 calorie pack concept - especially when the company comes up with an unique product that you can't get otherwise. These little Nabisco Chips Ahoy "Fudge-Drizzled" double-chocolate chip cookies are a good example. Like most 100 calorie packs, you don't get a ton of cookies, so you definitely need to slow down and savor. ;) These have a nice chocolate flavor base, and then you get the bonus of chocolate chips and that fudge drizzle. They hit the chocolate spot for me. I would (and have!) buy them again.